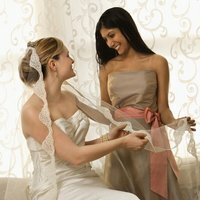 The eco-friendly-bridesmaid will definately appreciate inexpensive-bridesmaid-dresses as part of your green wedding party planning very much. Why? Obviously, it will save her some money, and she will have one less dress in her own closet that collects dust and eventually tossed years later. I think we've all had a few of these in our closets at one time. I know I have, and I don't remember getting a second wearing out of a bridesmaid gown ever again after the weddings I was in. I've never been a green-bridesmaid. I wish I had been because we didn't have inexpensive-bridesmaid-dresses. The costs for being a bridesmaid were quite significant to me at the time being much younger and in school. Not a lot of funds! Not that you couldn't come up with any fancy dress ideas with them afterwards if you have to. Long flowing dresses can be cut and shortened to make lovely cocktail dresses. They can be altered to be dressed down for that purpose, or enhanced with embellishments for bigger purposes. After the more formal weddings, did you know that bridesmaids can donate their bridesmaid dresses to a worthy project? Imagine for a moment, that you are a student and you want to design your own prom dress somehow for example, because you couldn't afford one directly from a boutique. Students who can't afford these luxuries (and there are many), can get in touch with the Glass Slipper Project based in Chicago. This is a program that distributes formal dresses to those who can't afford prom dresses. These dresses come directly from eco-friendly-bridesmaids who are recycling what can easily work for someone else. This idea has caught on everywhere, and I've seen groups springing up everywhere to pass on bridesmaid dresses to young girls needing Prom dresses. Everyone should be able to attend their own Prom, don't you think? So, this just goes to show that a very high percentage of bridesmaid dresses bought solely for one appearance in a wedding, are not used again by the individual who owned it. Remember, some brides pay for things, some don't. A dress, shoes, accessories, nail and hair appointments, shower and wedding gifts to mention a few of the expenditures that can be associated with a wedding, may prove to be quite a financial burden and tremendous source of worry for one or more of your bridesmaids. Maybe she doesn't know how to tell you, or wants to decline being part of your day because of the financial strain. And so with this is mind, and assuming you are a green-living bride, how about making an eco-friendly-bridesmaid out of each of your attendants? There are different ways you can approach this, depending upon the level of formality of your wedding. How green do you want to go? These general concepts may help you envision it, and keep their costs and yours down as well. Does your wedding party have to be in identical dresses? Do the dresses have to be brand new? Would a variety of shades and colors according to the season, or a color theme you have chosen work with what you want? Most girls already have at least one dress or two in their closets that could work as modest bridesmaid dresses if necessary and accessorized properly. Don't know until you look though. The girls might come up with ensembles that would suit your theme or color scheme beautifully. This could be a great solution to coming up with some form of cheaper bridesmaid dresses for everyone. Is there any reason why your green-bridemaids can't get together with things they already have from home? Could they "pool" their items and take a look at what each one has to offer in the way of accessories, dresses, heels, hats, sandals, purses, hair accessories and jewelry? Many girls own some kind of "glitzy" sandals or heels and almost everyone owns black heels. At least they could be borrowed for a day from somewhere I would think. If you are lucky, and if most girls tend to wear the same sizes one could borrow shoes from one, lend a dress to another and so on. This all depends on the bride and her preferences of course. Maybe no-one has anything that even semi-matches another. Possibly the bride opts for all one length of dress, who knows? Hopefully there are affordable bridesmaid dresses out there if nothing else will do. At least it can be donated later to a good cause and someone else out there can come up with some other fancy dress ideas for it. Having to buy new does not mean you aren't trying to be an eco-friendly-bridesmaid. It's about reducing whenever possible. You can always compromise. New dress, but the accessories are not a big issue. Even shoes can be dyed, so that can mean great savings to an eco-friendly-bridesmaid. And yes, some of us have more shoes and costume jewelry than we know what to do with. Cheap bridesmaid jewelry doesn't get any less expensive than that. Surely, something can be used from what's at home. If everyone can deal with their own nails and not make bridesmaid hair and makeup appointments, this is a great time-saver in terms of zero travel and cost as well. When it comes to hair, most everyone likes up-dos for bridesmaids. Visit the Updoprincess for some great bridesmaid up-do hairstyles you can do on your own, or with very little help. If everyone has exhausted all of their resources, and still needs a smaller or plus size bridesmaid dress for example or even jewelry in a certain color, check the thrift stores, consignment stores or vintage shops. As for jewelry though, someone you know most ALWAYS has something you can borrow. Recycling what is out there makes eco-friendly bridesmaid for sure. You can opt to give Ebay a try as well. There is a good selection of discount bridesmaid dresses to choose from and hopefully suited exactly to your price range. There are even bridesmaid dress patterns if anyone you know is up to the task of making your dresses for you. The bride can reduce alot of anxieties and worries by making sure her eco-friendly-bridesmaid is comfortable in what she is wearing, and that's much more likely if all of the girls can choose their outfits for themselves to some degree. Comfort and self-confidence is important too. I think these eco-friendly-bridesmaid concepts would be well worth exploring before sending everyone out on shopping sprees. It also shows some sensitivity to the financial circumstances some might be in at the time. Return To Wedding Carbon Footprint.